I also discovered a few days ago that I have 6 more awards that I didn’t have, which is something that always makes me happy! I want to thanks everyone involved in this project, I had an incredible crew and cast, this couldn’t have happend without them.Thanks guys. I hope you enjoy watching the movie as much as we enjoyed making it. The time has come, today is the day. 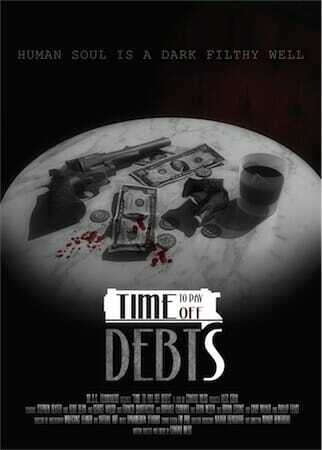 My last movie “Time To Pay Off Debts” is gonna be premiered tonight at 7 p.m. at Producers Club in New York City. I want to thanks to my crew and cast for an incredible job and specially to my producer Alex Corn, my brother Franco Quartuccio and my good friend Phil Felice for taking care of this screening. Thank you guys. Nothing more to say from my side, I hope you enjoy watching the movie as much as we enjoy making it. Let me make a quick summary of what have happened during these weeks and I couldn’t share with you because of the lack of time. We have the teaser poster of “Time to pay of debts”, this is the version that we are gonna use until we have the final version, a poster that is gonna blow your mind, drawn by hand by Miguel Fuster (the new one, not this). I would like to share with you an interview that Mobile Moviemaking made me a few weeks ago. And also an article where you can watch our teaser trailer. Yes, we released the teaser trailer some weeks ago, you can also watch it in the home page or right here. I also wanted to tell you that “Time to pay off debts” was premiered at Mojocon 2016 in Dublin last may the 29th. I want to thanks Glen Mulcahy for inviting me one more year and for hosting our premier. One more year I have to say that I felt like if I was in home, one of the best, if not the best, conference about mobile journalism and smartphone filmmaking. 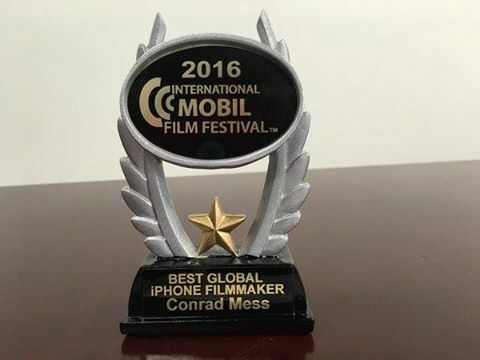 The very next day, may the 30th, “Time to pay off bets” was also screened in San Diego at San Diego International Mobil Film Festival, where I was awarded with one of the most important awards in my filmmaker carrer, “Best Global iPhone FilmMaker”. Thanks to Susy Botello for this incredible award and for helping me all these years. More than once I’ve said that music in my movies is as important as a character, or even more. Music drives you through the movie, improving your feelings very easily. In my previous movies, I chose my sountracks from a huge database of music tracks that you can find at shockwave-sound .com, you just have to pick the music you want and pay the license depending of how the distribution of your movie is gonna be. Most of the time I chose music from a composer called Pierre Langer, as for instance for “The Fixer“, I loved his music. This time I tried to contact him because I wanted to know if he could write the music for my incoming short film. I get to him, actually to their music and sound desing studio in Germany “Dynamedion“, and I say “their” because there are 2 geniuses at the head of this amazing studio, Pierre Langer and Tilman Sillescu. I got amazed when I discovered that they knew “The Fixer”, they knew about me and about my future feature “Dead End”. So after a few e-mails they decided to join “Time To Pay Off Debts” team writing the music (what Tilman (Dynamedion creative director) is doing for this project will blow your mind). We also will collaborate in my feature “Dead End”. Dynamedion also gives you the posibility of getting license to use their music tracks in your projects, you can find it here, or you can use their huge sound FX library, Boom Library. Check it out! I’m not kidding if I tell you they are one of the best, biggest and more important studio here in Europe, if you don’t believe me just take a look at what they have done. Dynamedion has worked in projects with Peter Jackson and Hans Zimmer, just to name a few. You can hear their work in projects like Matt Damon’s Bourne series or, the last project they have done, soundtrack for one of the most successful videogame saga, the latest “Hitman”. As you can see they are great musicians and artist, and I also can say they are great people and good friends. Thanks guys!